Project Sekong 2014: Sometimes the guys lark about, boys in spirit if not in age. The team explored a ravine that proved to be too steep to safely clear. 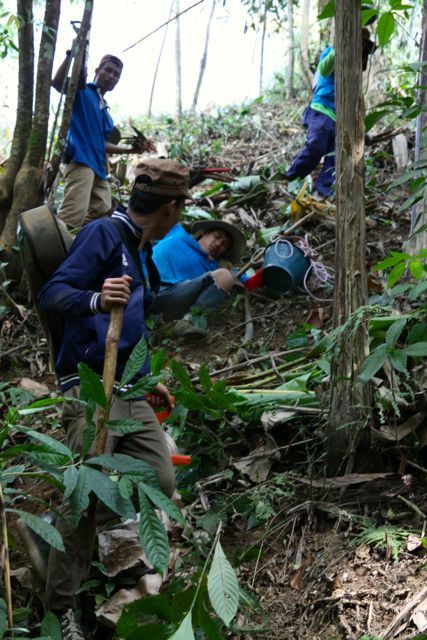 The deminers were eager to prove they could climb the hill even if they couldn't search for UXO. On this day they were more boys than men! We began work after lunch by hiking into to a miserable site. We first spent half an hour stumbling around at the top of a ravine looking for a safe route down. We couldn’t find so much as a rabbit run in the dense foliage, much less a path that the farmer would have followed when he hiked in to scrub cut the parcel. Miss Nida Janemany, the young “Coffee Assistant” who has been so helpful to us, hopped on her motorbike to find the farmer, his wife or another knowledgeable guide. The setting looked far from promising. Our side of the ravine was more cliff than hill and the far side rose nearly vertically above us. We couldn’t see the bottom of the ravine but we could hear the sound of rushing water down there. Finally, with the farmer’s wife as a guide, we made our way down the near side of the ravine and jumped what turned out to be a narrow but loudly bubbling stream. Unfortunately, we found that our initial assumption about the far side was correct. It was steeper than the bank we had just struggled to descend. We should have turned tail, retraced our skid marks up the side we’d just slid down, and called it a day. But someone, not me and not the team leader, decided to attempt a climb. That’s the problem with having such game, young men on the team. Sometimes, when things look impossible, they like to lark about for no other purpose than to collect adventure stories to tell their friends. The team started climbing, with the men pushing and pulling each other up. The lead man would grasp a root or sapling in one hand and then reach back with his free hand to clasp a lower man’s hand, arm, backpack or shirt. He’d strain to help the guy below clamber over him, and then push on the new leader’s foot or leg to steady him while he found a handhold ahead. As pairs proceeded in this manner, repeatedly leapfrogging one another, our laughter rang up and down the ravine. The men, boys in spirit today if not in age, were testing themselves and enjoying it. We all knew that even if we successfully scaled the hill there was no way we could clear it of ordnance and if, in madness, we attempted a search, no responsible Team Leader would ever certify the site as clear. Any work accomplished would be too slip-shod and sloppy. (I’ll remind readers that when we search a parcel for ordnance, if we miss a spot the size of a pin pong ball, we could be leaving behind a dangerous item capable of claiming a life or limb). Truth be told, we never reached the top. Common sense prevailed about three quarters of the way up. At the apex of our climb the guys braced their feet against tree trunks, lying down but, in fact, standing nearly upright. Everyone breathed hard for five minutes, rested for a further ten and then… what was to be done but climb back down? My responsibility? The reason I didn’t remain at the bottom of the hill or call the guys back when they started their climb? I needed photos to prove to CARE that we weren’t slackers abandoning a site without good cause.